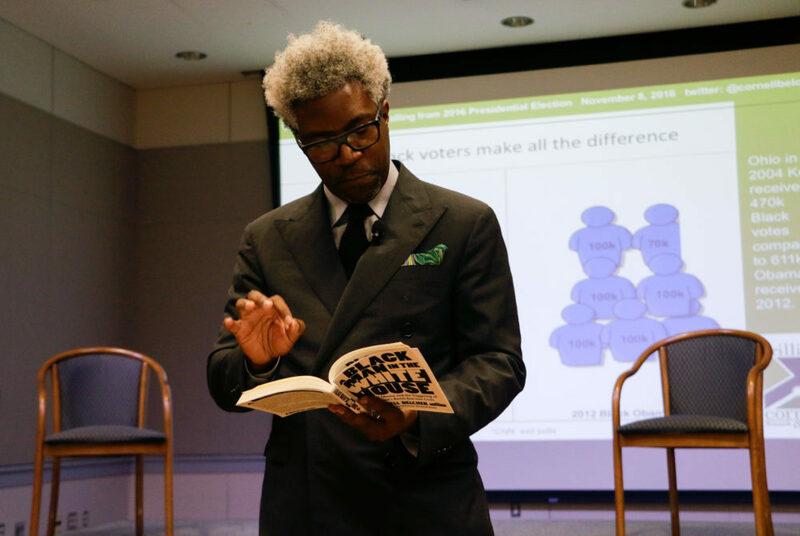 Cornell Belcher discussed the impact of race on American politics at a campus event Tuesday. Cornell Belcher, a pollster for former President Barack Obama during his 2008 and 2012 presidential campaigns, cited racial identity and animosity as one of the most important drivers of today’s party politics during an event Tuesday night in the Marvin Center’s continental ballroom. In a conversation with School of Media and Public Affairs Director Frank Sesno, Belcher talked about what went wrong for the Democrats in last year’s election and the role race played in shaping the campaign. Belcher previously worked as a CNN political contributor and pollster for the Democratic National Committee and is the author of “A Black Man in the White House,” chronicling what he called an increase in racial aversion during Obama’s presidency. The event was hosted by SMPA and co-sponsored by the Association of Black Journalists, the Black Student Union and GW’s diversity office. Belcher said the Trump campaign had revived “the Southern strategy,” a tactic used by Republican candidates several decades ago to win support from white southerners through coded appeals to racism. During the campaign, Trump painted a bleak picture of crime-ridden inner cities and argued that black voters didn’t have anything to lose by voting for him. Citing his own research along with that of other pollsters, Belcher said the Democratic Party has not won the white vote since the Civil Rights Act was passed in 1964. He said that racial issues had shaped the makeup of the Democratic and Republican parties for decades. This racial hostility, particularly among Republican voters, has increased over the past eight years with Obama in office, Belcher said. “Without President Obama, you would not have Donald Trump,” he said. The Obama campaign knew in 2008 that they had to “build a movement” to win the presidential election, Belcher said. He said this meant “changing the face of the electorate” by making it more representative of the country as a whole and turning out large numbers of minority and young voters. But the significant turnout under Obama did not translate to other Democratic candidates, as many were first-time voters unique to Obama, he said. Former Democratic presidential nominee Hillary Clinton’s turnout numbers among minority and young voters during the 2016 election were consistently less than Obama’s during both of his races, he added. Belcher said votes for third-party candidates were very costly to the Democrats in last year’s election, particularly in states Trump narrowly carried. “Turnout wasn’t great, but turnout wasn’t the issue here,” Belcher said about why Clinton might have lost. Polls showed that those who used a “protest vote” were more likely to feel hopeless about the American political system, a warning he said Democrats should take seriously.